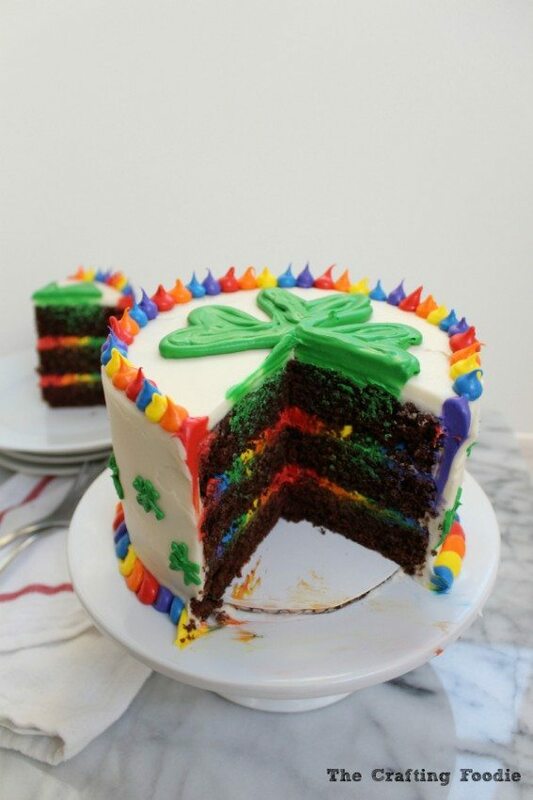 Rainbow cakes have been all the rage on Pinterest for some time now, and I love making rainbow treats, particularly around St. Patrick’s Day. This year, I wanted to incorporate the rainbow theme with a chocolate cake because, in my book, everything is better with a little chocolate. But that meant I couldn’t just dye the cake layers. I had to get a little creative. So my answer to the challenge of a Chocolate Rainbow Cake is this beauty. 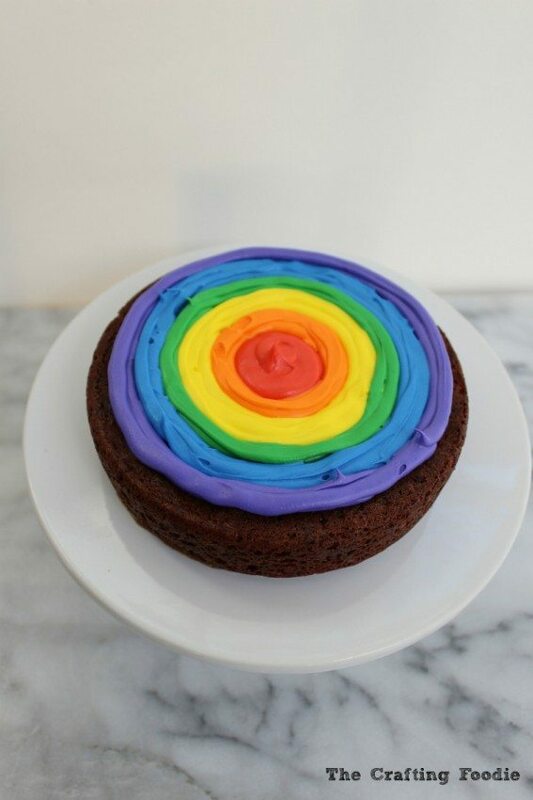 Instead of incorporating the rainbow into the chocolate cake itself, I used the frosting, particularly the frosting between the layers, to provide the rainbow effect. After filling the second layer in the same manner, I put the cake in the fridge for about 20 minutes to let it set. Then I put a thing layer of frosting all over the cake to seal in the crumbs. Threw it back in the fridge for about 30 minutes. Finally, I put on the final layer of frosting and the decorations. While the outside of this Chocolate Rainbow Cake is festive and rainbow in it’s own right, it’s the inside of the cake that’s the real showstopper. When I cut into the cake, my kids were blown away with the rainbow filling. My older daughter asked me, “How did you paint a rainbow on the inside of the cake?” And another guest exclaimed, “Oh, I thought it was just the outside of the cake that was rainbow. I couldn’t image how the inside of a chocolate cake could be rainbow!” And there you have it. Mission accomplished – a Chocolate Rainbow Cake! 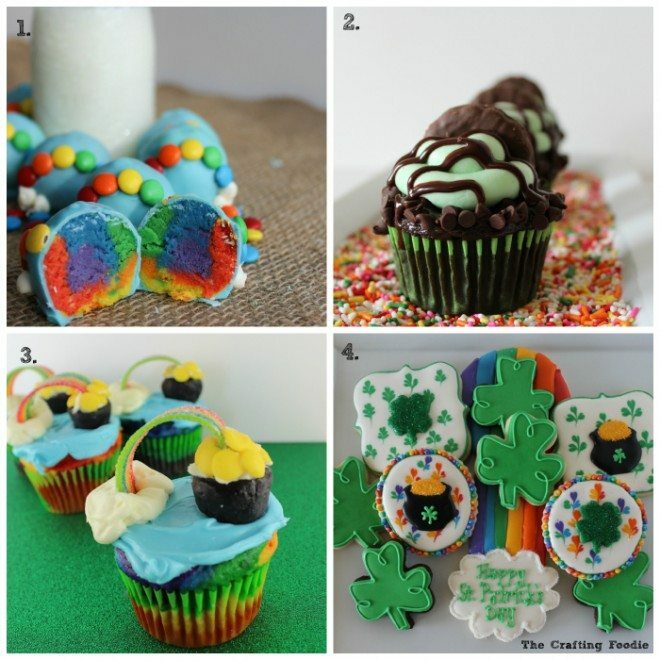 If you love rainbow foods as much as I do, or you’re looking for some good ‘ol St. Patty’s Day inspiration, check out these Rainbow Pot of Gold Cupcakes, these St. Patrick’s Day Sugar Cookies, Grasshopper Cupcakes and these Rainbow Cake Pops. This moist, rich Chocolate Rainbow Cake is perfect for St. Patrick’s Day! 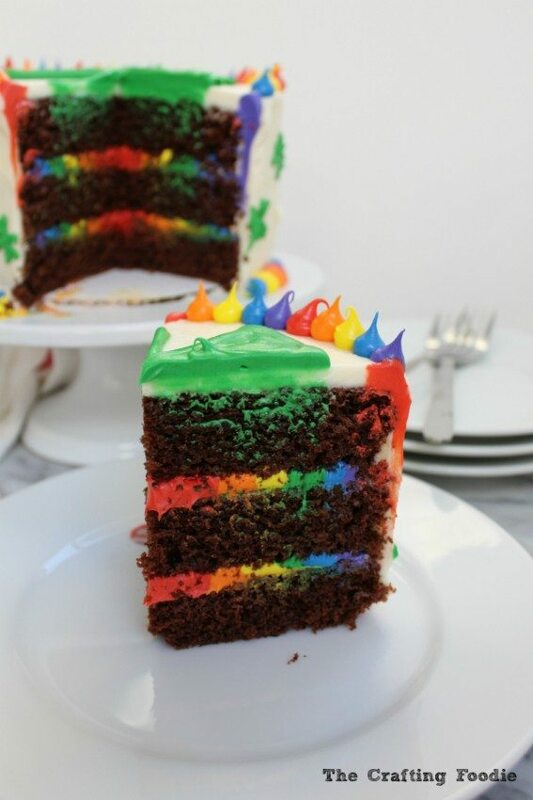 While the outside of the cake is festive, it’s the inside of the cake that has a bright, rainbow filling. With parchment paper, line 3 6-inch round pans. Grease the pans. Set them aside. In a medium bowl, sift together flour, cocoa powder, baking soda, and salt. In a large bowl, whisk the sugar and oil together. Add the egg and vanilla and whisk until just combined. In a measuring cup, add the milk and vinegar. In three additions, alternately add the dry ingredients and the milk to the sugar mixture. Start and end with the dry ingredients. Divide the batter evenly between each of the pans. Bake for about 30 min or until a toothpick inserted in the center of the cake comes out clean. Allow the cakes to cool in the pans for about 15 min. Then invert on to cooling racks. Allow the cakes to cool completely. For the frosting: In the bowl of a mixer fitted with a paddle attachment, mix the butter and sugar until fluffy. Add the vanilla and cream. Beat until fluffy. Measure out a scant 1/4 of a cup of frosting in 6 separate bowls. Tint each bowl with one color of the rainbow. Then fill them as shown in the photo in the post. Once the cakes are filled, place the cake in the refrigerator to chill for about 20 minutes. Use the remaining frosting to crumb coat and frost the cake. The leftover colored forsting can be used to decorate the cake. If you’re interested in checking out all of my recipes, you can find me at The Crafting Foodie where I share decadent desserts and healthy, easy to prepare weekday meals. 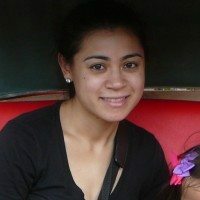 You can also find me on Pinterest, Facebook, and Google+. That is an amazing cake! Pinned! This is so pretty! I was trying to figure out how it was rainbow inside, but icing it that way smart! I Pinned this recipe!! Its perfect. My daughter loves chocolate cake (she asks for one every year) and her Birthday is on St. Patrick’s day!! So excited to make this for her. Thanks for sharing. It is too simple!!! Today on my mother’s birthday, we made this cake. It was very delicious!!!! Everyone praised of this cake.